English : Song of a Black-chinned Hummingbird. Black-faced female impala (Aepyceros melampus petersi) drinking from a water hole named "Kalkheuwel Bore Hole" in Etosha National Park, Namibia. English : Black-faced female impala (Aepyceros melampus petersi) drinking from a water hole named "Kalkheuwel Bore Hole" in Etosha National Park, Namibia. English : A maize dish making by roadside vendor in Salem, Tamil Nadu, India. Italy, Sicily, Agrigento, Valley of the Temples, Temple of Juno Lacinia. English : Italy, Sicily, Agrigento, Valley of the Temples, Temple of Juno Lacinia. English : A marsh fly (Trypetoptera punctulata) moving in the grass of a meadow. Taagepera manor main building in Estonia. English : Taagepera manor main building in Estonia. English : A beetle attacking and preying upon a treefrog. English : Finnish gymnast Laura Viherva. English : A severe case of sleep apnea: after strong rhythmic snoring, the patient does not breathe for a long (32 s) period of sleep apnoea before snoring is finally resumed (the slightly audible background noise is due to a TV set). Coulommiers cheese, a cousin of the brie cheese. English : Coulommiers cheese, a cousin of the brie cheese. English : Pine Grosbeak, Cap Tourmente National Wildlife Area, Quebec, Canada. Common Redpoll in the background. English : Door to Hell, a burning natural gas field in Derweze, Turkmenistan. English : Dog walking with an Irish Wolfhound mix in the Mission in San Francisco. Portrait of Fedor Dostoyevsky, by Vasily Perov. English : Portrait of Fedor Dostoyevsky, by Vasily Perov. Scrum from a rugby match between Stade Toulousain and Gloucester Rugby, 13 November 2011. English : Scrum from a rugby match between Stade Toulousain and Gloucester Rugby, 13 November 2011. English : The ship "Noordam" of the Holland America Line brings the first relief supplies from America to the port of Rotterdam, as agreed upon in the Marshall Plan. On board there is wheat, general cargo, soy oil, agricultural machinery, steel and cars. SHOTS - with fireworks, the ship's nachtst (three hours in the morning), welcomed into the port of Hoek van Holland - in the dawn steam reached the port of Rotterdam and moors - the Dutch swimmer Nel van Brook rushing down the ramp and is greeted on the dock - port workers begin using cranes to unload the ship - the U.S. ambassador, Dr. Henry Baruch (goatee and cane), comes with his wife (?) And company, starting on the quay and went to the Philadelphia pilot of HAL, - int. pilot: a great company listens to speakers, including Foreign Minister, Mr. CGWH Baron of Boetzelaer van Oosterhout, the Minister of Economic Affairs, Dr. JRM van den Brink, and Dr. Baruch, - the captain of the ship, Koster, submit to the Minister of Agriculture, Fisheries and Food, ir SL Mansholt, symbolically, a small bag of wheat - Baruch, Mansholt and company walk the dock road, - an elevator gets wheat from the hold of the Noordam and pours it into the hold of smaller vessel. Dwarf honey bees (Apis florea) were introduced from Oman to Jordan most probably through a cargo ship that docked in the port of Aqaba. First reported in 2007, this species has established in southern Jordan and Israel and is considered there as invasive. The agricultural and conservation sectors in Israel have expressed fears that the bees will spread northwards, potentially competing with local bees for food resources and jeopardizing crop pollination. Pictured here is a worker foraging on a native plant on the outskirts of Eilat. English : Dwarf honey bees (Apis florea) were introduced from Oman to Jordan most probably through a cargo ship that docked in the port of Aqaba. First reported in 2007, this species has established in southern Jordan and Israel and is considered there as invasive. The agricultural and conservation sectors in Israel have expressed fears that the bees will spread northwards, potentially competing with local bees for food resources and jeopardizing crop pollination. Pictured here is a worker foraging on a native plant on the outskirts of Eilat. 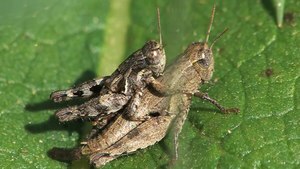 English : A mediterranean species of short-horned grasshoppers (Pezotettix giornae) in copula. A young wild boar in his environment in the Wisentgehege Springe game park near Springe, Hanover, Germany. English : A young wild boar in his environment in the Wisentgehege Springe game park near Springe, Hanover, Germany. English : On the street where you live (हिंदी टाइटल : तेरे घर के सामने) Neighbours and neighbourhoods often shape our identities.This film by Snehal Phadakale tells us about an enigmatic neighbour whose mansion is next to a slum. He is rarely seen but very influential in the lives of the people in the locality. A sight of dry, hot and salt-encrusted Etosha pan over the parched savannah in Namibia. The air in the background is hot, very shimmering and dusty. The tree is an acacia tortilis. English : A sight of dry, hot and salt-encrusted Etosha pan over the parched savannah in Namibia. The air in the background is hot, very shimmering and dusty. The tree is an acacia tortilis. English : Curling is a sport in which players slide stones across a sheet of ice towards a target area which is segmented into four rings. Lectotype, partial individual from excavation 'St' at Kindope, Tendaguru, Tanzania; Length 4,5 m; Museum für Naturkunde Berlin. English : Lectotype, partial individual from excavation 'St' at Kindope, Tendaguru, Tanzania; Length 4,5 m; Museum für Naturkunde Berlin. English : On the occasion of the tenth anniversary of the Budapest Open Access Initiative in February last year, philosopher Peter Suber is interviewed about his views on past, present and future developments in open access to scholarly publications. Gabrielle Cot, daughter of Pierre Auguste Cot, painted by William-Adolphe Bouguereau. English : Gabrielle Cot, daughter of Pierre Auguste Cot, painted by William-Adolphe Bouguereau. A female Pygmy Dartlet (Agriocnemis pygmaea), a very small damselfly (less than 20 mm long). Photographed in Burdwan, West Bengal, India. English : A female Pygmy Dartlet (Agriocnemis pygmaea), a very small damselfly (less than 20 mm long). Photographed in Burdwan, West Bengal, India. Iguana (Iguana iguana) at Butterfly World, Stellenbosch, Western Cape Province, South Africa. English : Iguana (Iguana iguana) at Butterfly World, Stellenbosch, Western Cape Province, South Africa. English : Crochet is a process of creating fabric from yarn, thread, or other material strands using a crochet hook. European flounder (Platichthys flesus) near Vääna-Jõesuu in Estonia. English : European flounder (Platichthys flesus) near Vääna-Jõesuu in Estonia. English : The small European Empidid fly Dolichocephala irrorata shows a strange looking mating behaviour. This 3 mm sized couple was found in a forest near Marburg, Hesse, Germany. A Belgian F-16 Fighting Falcon during a training flight before the Air Show 2009 in Radom, Poland. English : A Belgian F-16 Fighting Falcon during a training flight before the Air Show 2009 in Radom, Poland. English : Hundreds gathered inside and outside the landmark bar, where protests over a 1969 police raid helped trigger the movement. Shortly before midnight, Democratic Gov. Andrew Cuomo signed the bill to make gay marriage legal in New York, the country's most populous state. A male grasshopper of species Atractomorpha lata photographed at Burdwan, West Bengal, India. English : A male grasshopper of species Atractomorpha lata photographed at Burdwan, West Bengal, India. Crater-like salt formation on the Dead Sea surface shot from a helicopter at approximately 400 feet (120m). English : Crater-like salt formation on the Dead Sea surface shot from a helicopter at approximately 400 feet (120m). View of the crescent moon through the top of the earth's atmosphere. Photographed from International Space Station by Expedition 13 crew over the South China Sea, just south of Macau. 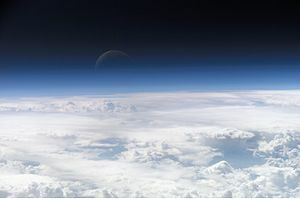 English : View of the crescent moon through the top of the earth's atmosphere. Photographed from International Space Station by Expedition 13 crew over the South China Sea, just south of Macau. English : A pair of Common Cranes (Grus grus) showing the specific mating behaviour. Kuremaa manor windmill in Estonia, built probably in the middle of the 19th century. English : Kuremaa manor windmill in Estonia, built probably in the middle of the 19th century. English : Entrance of the Château de la Madeleine in Chevreuse, France. The Chesme Church in Saint Petersburg, Russia. English : The Chesme Church in Saint Petersburg, Russia. English : An adult passionvine hopper (Scolypopa australis) moving around on a New Zealand flax (Phormium) leaf. Portrait of Naser al-Din Shah Qajar, king of Persia (1831–1896). English : Portrait of Naser al-Din Shah Qajar, king of Persia (1831–1896). English : RhB ABe 8/12 "Allegra" multiple unit with a local train to Tirano in the grade between Bernina Lagalb and Ospizio Bernina. English : A movie of the coronal rain (right limb of sun) in the 304 Å wavelength. The footage in this video was collected by the Solar Dynamics Observatory's AIA instrument. SDO collected one frame every 12 seconds so each second in this video corresponds to 6 minutes of real time. The video covers 4:30 UTC on July 19th to 2:00 UTC on July 20th, a period of 21 hours and 30 minutes. English : High-speed photography of a light bulb shot with an airsoft pistol (positioned right of the lamp). English : View from the bridge behind the dam of the Kemnader See at the border between Bochum and Hattingen to the dam's boat lane (and a parallel fish ladder). Bayer AG factory in Leverkusen, Germany. English : Bayer AG factory in Leverkusen, Germany. English : A video documenting cheetahs (Acinonyx jubatus) running. The film was shot using a Phantom camera at 1200 frames per second.